Welcome to Vol. 2 of The Agenda. In a single issue, we’ve already learned so much about producing a newsletter. For instance, the importance of not being married to the editorial calendar – we were all set to do a deep dive into social activism and the Olympics to wrap up February. Then, the Parkland shooting happened, and a group of grieving teenagers from Marjory Stoneman Douglas High School resolved to do whatever they could to make their school shooting the last one. Enter #NeverAgainMSD. In mere weeks, the students have harnessed the power of PR and shown the world what is possible when you’re young, idealistic, and unwilling to accept bogus political reasons for why something can’t be accomplished. This month, we take a look at how these students seized upon an opportunity to use communications as a vehicle for change and speak truth to power. It’s impossible not to feel inspired by the tenacity of the Parkland students. With the NRA on the defensive after several major corporations including Delta Airlines; United Airlines; UPS and MetLife severed relationships with it, we’re hopeful that this movement is actually going to bring about reform. But how is it that the stars have aligned at precisely this moment, when this is far from the first mass shooting? Yulu’s Catherine Gao looks at what’s different this time around for the Impact Relations blog. Will this surge of student advocacy lead to policy change? In the days immediately following the Parkland shooting, we saw students and grieving parents pleading to news cameras for lawmakers to do something about gun violence. Students are “calling BS” in front of crowds in charged rallies. 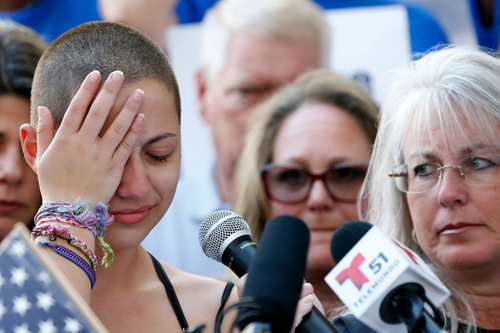 More specifically, at a rally in Fort Lauderdale, student survivor Emma Gonzalez made an impassioned speech decrying the impotent “thoughts and prayers” being sent by President Trump and other politicians, and emerged as a leading voice in the movement to end the school shooting epidemic. Alongside fellow students Jaclyn Corin, Cameron Kasky, Sarah Chadwick, David Hogg and more, Gonzalez is fighting for an end to the sale of assault weapons to civilians. She wrote this op-ed about her life since the shooting for Harper’s Bazaar. This much is clear: America’s youth are now growing up with the threat of their schools being shot up, and they’ve had enough of it. Students who were advocating for gun control since this month’s massacre, boldly confronted Senator Marco Rubio at CNN’s Town Hall, scoffing when he outright declined to refuse future campaign donations from the NRA. Despite the fact that gun control measures continue to fail in the Florida House, the students are proving they have powerful allies, as well. They’re organizing the March for Our Lives with the help of Oprah, George and Amal Clooney, Planned Parenthood, Everytown and Moms Demand Action, as well as an entertainment PR firm, 42West. Buzzfeed documented the groups and individuals helping the teens organize. Whose voices aren’t we hearing, and why? As with last month’s exploration of #MeToo, we have to ask ourselves: why the world is taking notice now? The Parkland students aren’t the first to demand gun reform and their mostly affluent student body doesn’t represent the demographic most affected by gun violence. Clifton Kinnie, a Ferguson, MO native and founder of OurDestinySTL, came out to challenge why protests led by students in his hometown after the killing of unarmed, 18-year old Michael Brown by a white police officer haven’t been received the same way (he’s been acknowledged by at least one Parkland student who agrees). This piece for MTV News profiles how the students of Ferguson are fighting for a better future (and have been for some time). How big can they take this? If, like me, you were hoping this surge in student activism would reverberate into the climate action space, hope no further. Youth have been engaged on climate issues for years, some even going so far as to sue the Obama-then-Trump administrations for violating their constitutional rights through inaction on climate change. But it’s the students of from Marjory Stoneman Douglas (tweeting with @NeverAgainMSD and #neveragain) bringing the NRA the fight of its life that helped galvanize organizers of ZeroHour, a series of nationwide climate marches slated for July 21, during which the student organizers will confront lawmakers with their list of demands for a livable climate. The students discussed their activism and the boost from @NeverAgainMSD with Grist. Let’s Give a Damn, the Podcast: with the hope of not sounding like a walking advertisement for this podcast — if you’re not tuning in to Nick Laparra’s super sincere, dive-deep chats with ‘ordinary people doing extraordinary things’ you’re passing up something free, healthy and delicious. It’s like opting out of a handmade gelato on a hot, sunny day. Listen here. Cause Marketing, the newsletter: subscribe to this do-good/make-it-better weekly digest and there’s no surprises as to what you’ll find. That’s not to say it’s boring or predictable. On the contrary — it’s as timely as your commuter paper. The difference is, you’ll feel positively optimistic after reading it, and if you work in PR or marketing, you might read something that will inspire your next campaign. Check it out here. Want a copy of The Agenda sent straight to your inbox monthly? Subscribe here.